Student Services consists of a range of teams that support our students to settle and stay at the College, and deal with problems that may affect their learning through professional advice and help. The Service provides specialist support and advice for prospective and current international students at the College on immigration issues, registration and welfare legislation, as well as advise on and develop initiatives to improve the student experience. All international students are covered by a health insurance. As a Larnaca College student, we are committed to providing you with the necessary information, guidance and support for all aspects of your academic study, offering both personal and practical solutions to help you through your time at college. It is also our responsibility towards our students to create an interesting and supportive environment that meets their wide range of interests and talents. The College offers a variety of clubs (football, cricket, badminton and chess) and it is an ideal way to discover new interests, meet new people with similar passions, make new friends and of course create memories. Larnaca is a vibrant, lively town that is constantly expanding with exciting new social hotspots. With everything you need, from an excellent shopping experience to a great night out at some of Larnaca’s best bars, the town is packed with things to do, places to go and things to see. If it’s food you’re looking for then Larnaca offers a range of brilliant local restaurants as well as the big brand favourites, and if you need entertaining then there’s K-Cineplex, festivals and exhibitions for you to visit. It is worth visiting both Kebir (Buyuk) Tzami Mosque and Hala Sultan Tekke Mosque. Kebir (Buyuk) Mosque is located in walking distance from the college and just opposite the Medieval Castle and it is perhaps the first Ottoman mosque in Cyprus. However, Hala Sultan Tekke, is located 3km west of Larnaka on the main Salt Lake.You can always find out more about what’s going on in Student’s Orientation Handbook. On behalf of the Larnaca College. 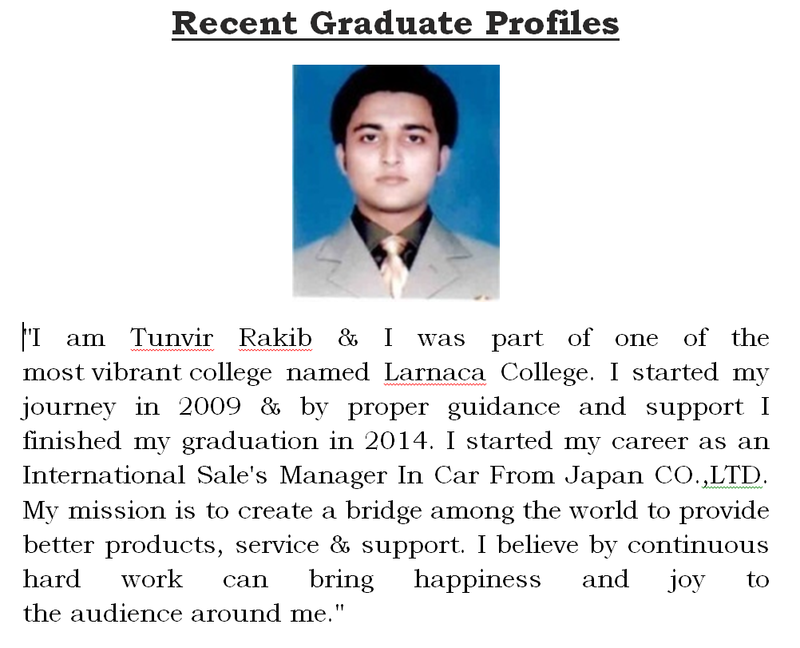 At Larnaca College, we aim to provide practical employability support to students, graduates and alumni. 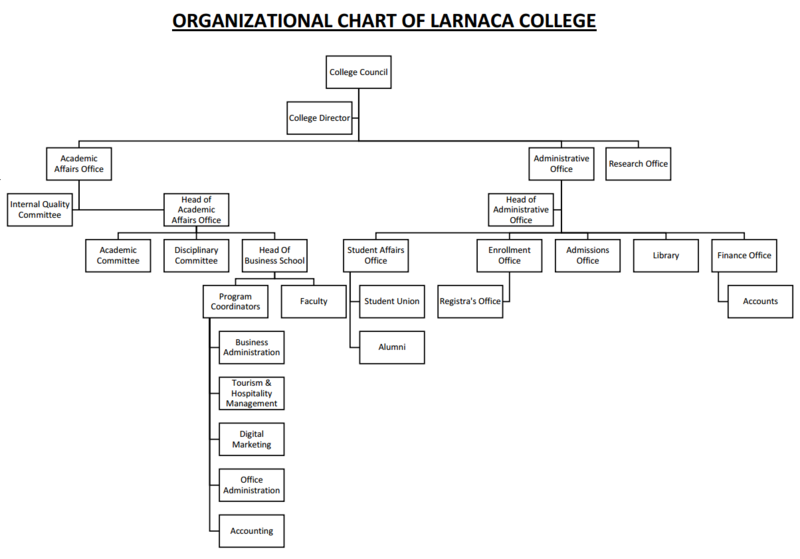 The Larnaca College Career Office gives students the opportunity to succeed in a competitive job market and gives them the help that they need. To evidence our commitment to student success, our employability support continues even after they leave College. We want you to feel at home during your stay at Larnaca. Larnaca has a large supply of private rental accommodation in areas close to the College. Our external accommodation services are dedicated to help students upon request regarding accommodation in the private sector, and it provides useful general housing advice and listings of available properties. The Alumni Association is sponsored by Larnaca College and its mission is to create a lifelong and worldwide community of alumni through increased opportunities for meaningful engagement in order to nurture awareness, pride, participation, volunteer involvement, and philanthropic commitment. The Alumni Office ensures a close relationship between graduates and the College. Even more importantly, it offers an excellent opportunity for successful professionals whose continued contact with the College is essential to the ongoing development of the College and its graduates. Special rates for all academic programs (undergraduate) for spouses and children of graduates. Full use of the library. Free use of all buildings and facilities for the Alumni Association.